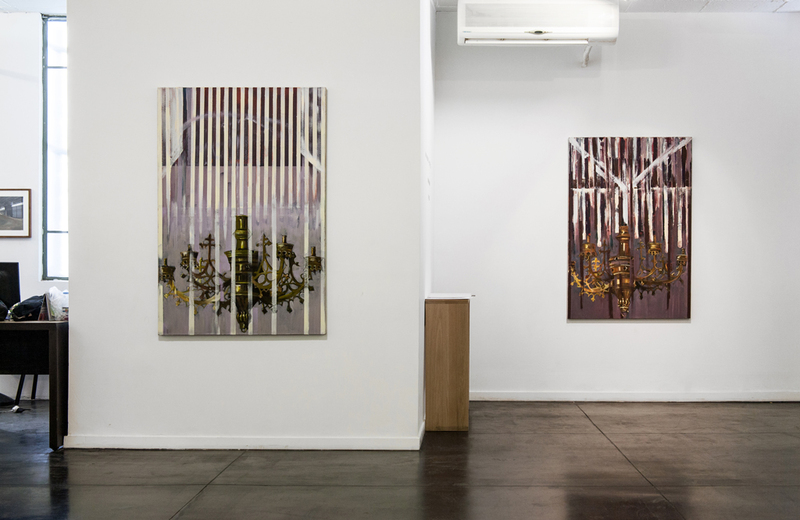 Jonathan Hirschfeld works like an alchemist of painting, searches for the moment colors and forms turn to magic, iron turns to gold, for the philosopher's stone. In Foramen Magnum, his solo exhibition in Raw Art gallery, he journeys through historical moments: van Eyck and Rubens, Northern Renaissance and Baroque, Zaritsky and Kupferman, pivotal figures in Israeli Art History. 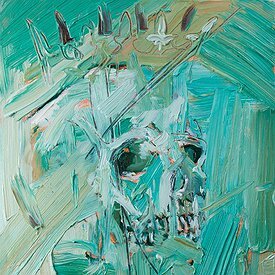 In a series of chandelier paintings, drawings after Rubens's Samson and Delilah, and the paintings "Foramen Magnum", his brushstrokes occasionally hasten to near agitation and then engage in the fine veins of a leaf or a single line, melding together signs and languages of painting. The paintings, their substance consisting of seemingly unfeasible hybrids, are a crystal ball, offering the viewer, through art, a clear vision, despite the never ending complexities and power struggles that encircle the world and blur the vision in the glass. Foramen Magnum (Latin: "great hole"), the name of the exhibition, refers to a hole in the brainstem through which the spinal cord connects to the base of the skull. The location of the Foramen Magnum determines the angle of the head, along with the field of vision. In Pre-historic man and primates it was located at a high point in the head, making them face upwards to the sky. Throughout human evolution, as man's posture gradually erected, the spinal cord progressively inserted the skull at a lower position, holding the head vertically and thus making the eye view turn straight, forward. 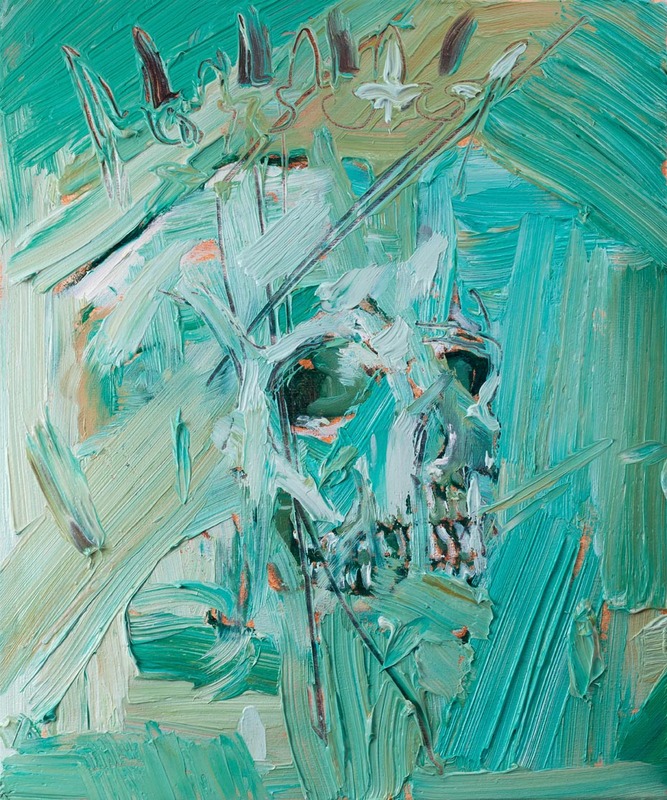 The two works that share the title of the exhibition depict skulls from below. We see half of the jaw, the base of the head and the Foramen Magnum. The dramatic foreshortening is painted on a bubblegum- pink background (a Raffi Lavie pink?) 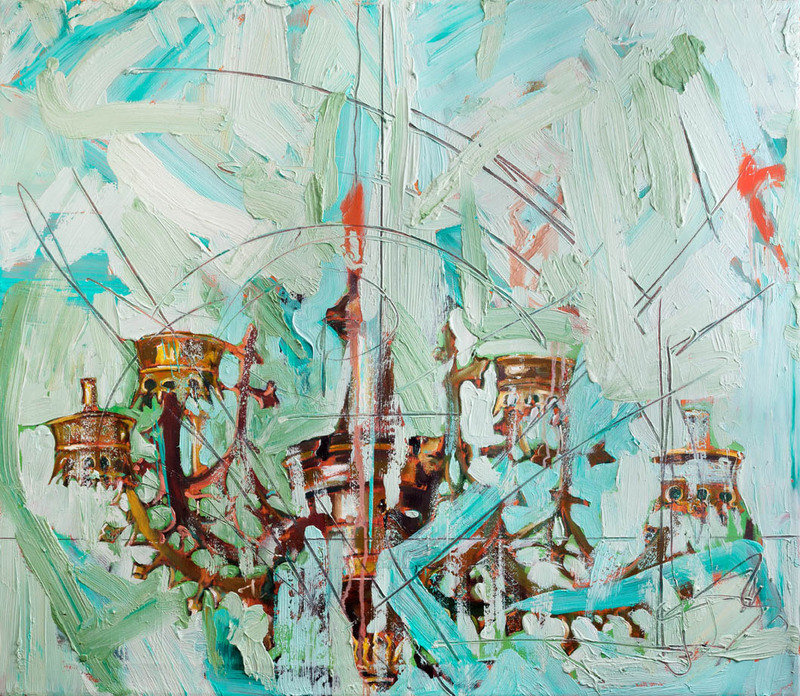 on the top part of the canvas, while the bottom abounds with broad brushstrokes in green, white and orange. 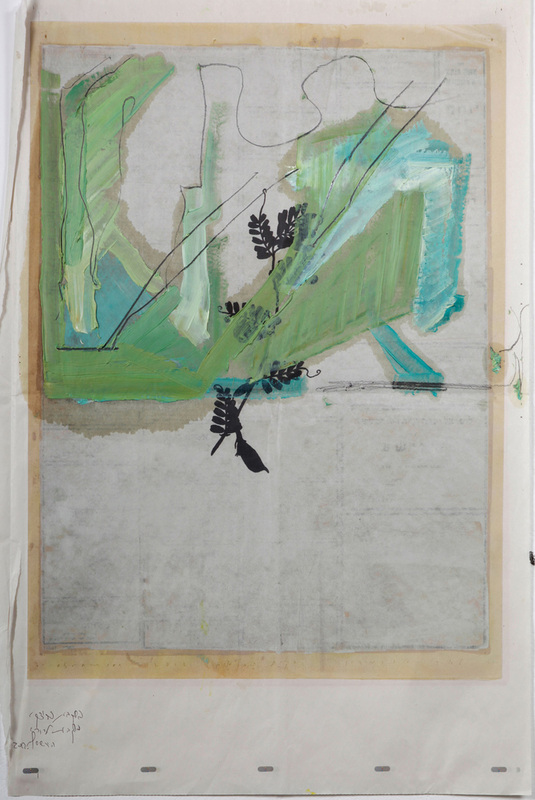 A serpentine line engraved with the tip of a paintbrush in the paint layers, recalls the scribbles of Arie Aroch. The image is like a knot that refuses to disentangle. 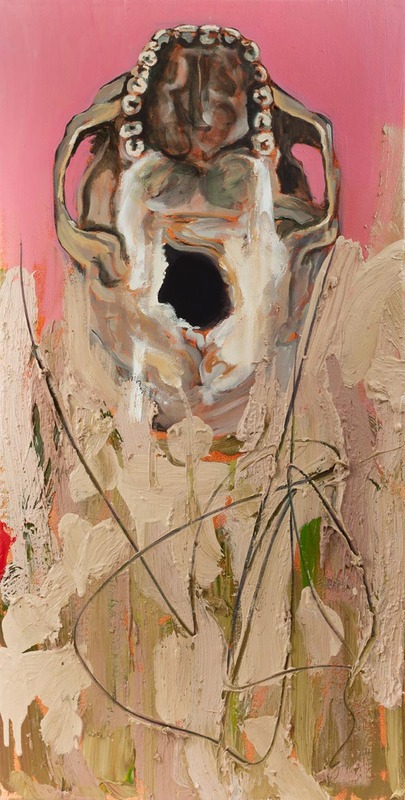 At first glance, the irregular angle of the skull makes it look like a large, distorted, battered and depleted flower, bringing to mind the wonderfully venomous term "Flowers of Evil" (Les Fleurs du Mal) Baudelaire's 1857 poetry book. 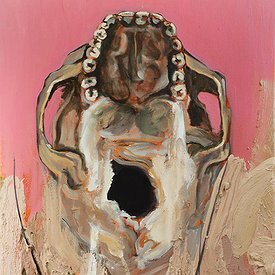 After deciphering it to be a skull, the violent image makes the pink color look even more sickly and saccharine. 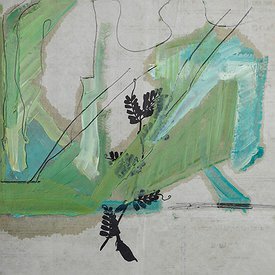 In relation to the series of Samson drawings in the exhibition, one is reminded of the story of the donkey's jawbone that Samson found and used as a weapon to kill the Philistines. The Foramen Magnum, a near black hole, looks like an open, screaming mouth, releasing a great wail of despair. 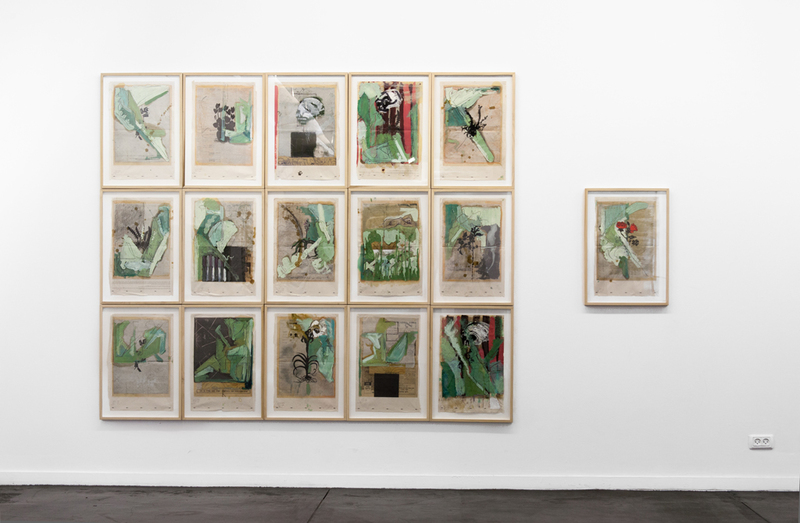 The works study the inner logic of beauty and violent deformation. 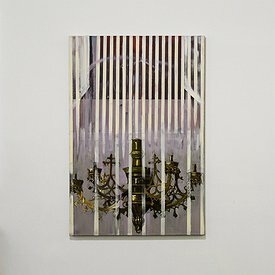 The Chandelier series is composed of larger and smaller paintings. Their epicenter is a bright brass chandelier, a symbol of European culture and grandeur, an embodiment of religious attributes of light and mercy. Chandeliers are not a common image in Israeli Art, though they are certainly recurring. Shuky Borkovsky and Joshua Neustein are two artists that have been using the image for years. Hirschfeld chose a particular chandelier- the chandelier that appears in the upper part of The Arnolfini Portrait 1434 by the Flemish Johannes Jan van Eyck, one of the earliest paintings in oil colors. The paintings iconography and iconology are constantly revisited and challenged (similarly to another masterpiece Las Meninas by Velázquez, 1656). The size of the chandelier in the original painting is approximately ten centimeters. Van Eyck signed below it, as artists often signed their work in churches: Johannes de Eyck fuit hic (Johannes van Eyck was here). The chandelier signifies the portrayed couples' material wealth, however the fact there is only a single burning candle, above the head of Giovanni Arnolfini, is perceived to be a symbol of mortality. In other interpretations, the candle symbolizes the Holy Ghost or the watchful eye of divine providence. The two large paintings by Hirschfeld present the chandelier in what may be described as the backstage, in reference to the paintings of Moshe Kupferman (1926-2003). Kupferman created throughout the 1990's and until his death many works with straight lines and a pictorial scenario of dreamy- nightmarish purples and smoky grays that bring to mind contaminated milk. The reference to Kupferman in the Hirschfeld paintings, juxtaposed with the grand brass chandelier reminds one of the contrasts in Paul Celan's Death Fugue, black milk and the gleaming golden hair of Margareta. 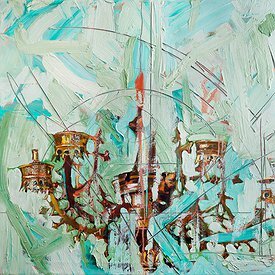 In the smaller chandelier series, a clouding effect in cold colors of greens and blues nearly cover and conceal the chandeliers. As they float like a warm moon, they radiate through brushstrokes referring to Zaritsky's manner of work, an artist who played a crucial role in local art history. The version of abstract he created, paradoxically named "Lyrical Abstract" becomes in Hirschfeld's interpretation an eruption of pale, almost blinding colors and light, clasping at the arms of the chandelier like an injured beast. Hirschfeld draws after Peter Paul Rubens' Samson and Delilah (1609-1610). The painting is rich with color and subplots, abundant in quotes from art history but nevertheless keeps a reserved stance toward the crucial moment it enacts: Samson, resting in his beloved Delilah's lap, his hair cut by a Philistine, while a maid is holding a candle to better his sight. Samson's desperate need for Delilah's love made him reveal that his power lies in his hair. Hirschfeld, in his drawing - paintings (the term mixed technique is correct, but imprecise) explores parts in Rubens' painting, thus revealing his appreciation for Rubens, but also the moment when he realized the deep, tectonic rift that has grown between the artist and the subject. With a skillful, boisterous hand, Hirschfeld deliberates with Rubens on the time that has passed and on the cultural ocean that lies between them. Rubens painted the sleeping Samson's arm as a quote of the lifeless Jesus taken down from the cross in the Florence Pietà (1553-1547) by Michelangelo, one of his late and extremely moving sculptures. The enormously disproportionate arm stands for helplessness and surrender in both cases. In the first drawing in the series, Samson (Rubens) I, Samson is drawn in ink while the other characters are omitted. The bright pink rich material of Delilah's dress has turned to a diluted pink blanket covering Samson, with the red blood stains from the end of the story, already there. 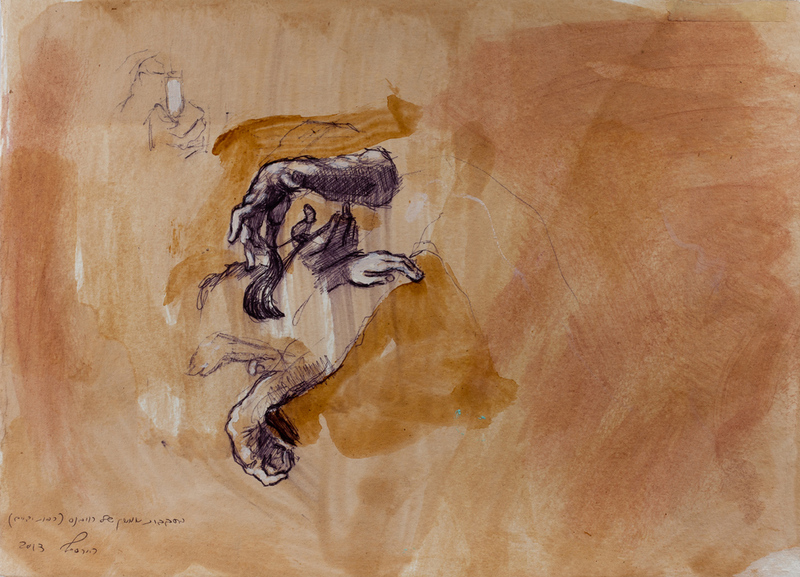 In another drawing - painting, Hirschfeld concentrates on the dramatic quality of hand gestures- the hand of the Philistine cutting Samson's locks, gently holds his hair like it was a lover's ringlet taken for memory; Delilah's white hand resting on the sleeping Samson's shoulder in never ending tenderness; the maid's clenched hand around the candle. 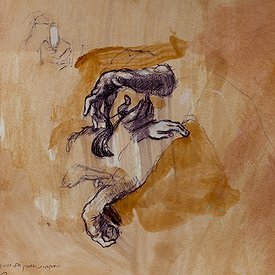 The drawing elucidates the complex communication achieved with hands, while the focus on them emphasizes their sculptural qualities. They become the summary of the story. In Samson (Rubens) V, Hirschfeld follows Rubens' structure but changes it in search of a new form of subjectivity, of what may be described as the destination point, the crossing line. The main character's face, Samson, is multiplied and he looks younger than in the original painting. The Philistine's face is more visible, and Delilah seems detached, or as if about to fall asleep gazing, over her bare chest, on the betrayed Samson. In the background the soldiers wait behind the door, for Samson to lose his power along with his shorn tresses. Rubens accentuated the comparisons between Samson and Jesus- the Philistine soldiers are like the Roman soldiers coming for Jesus, Delilah resembles Maria Magdalena and Samson Jesus, whose giant arm is quoted, as aforesaid, from Michelangelo. Hirschfeld's eye is immersed in reconciliation; he sees the drama as a momentary, inevitably doomed tragedy. In Foramen Magnum Hirschfeld explores the angles of observation: his immediate history in local Israeli art and his cultural roots in European renaissance and baroque. 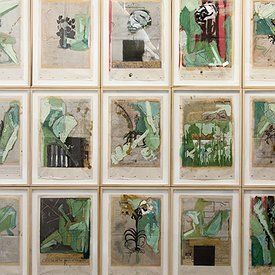 In painting and drawing, memory and yearning he offers a dramatic confrontation between contemporary painting practices and art historical precedents.